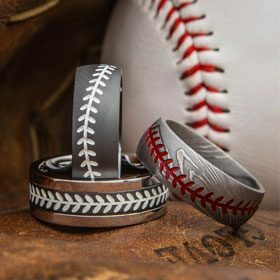 So you wanna know about camo rings? When we first unleashed our camo rings on the world, we had no idea we would end up leading a revolution, but now, years later, our camo rings remain one of our proudest accomplishments. They are still our most popular style, and because people are as crazy about camo as we are, we get a lot of questions about them. The ones we hear the most are answered in this handy guide. If you don't see your question below, we still have the information you need. Please email us or call us toll-free at 1-866-215-1861. How long will it take to make my camo ring? I need my camo ring sooner than your estimate. Can you rush my order? 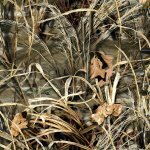 What camouflage patterns do you offer? 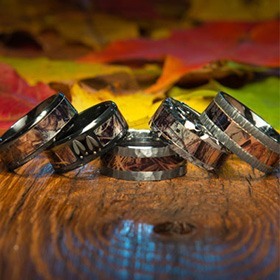 Do your camo rings come with a guarantee? Can my camo ring be resized? How do I take care of my camo ring? Can you create a custom camo ring to my specifications? Most of our camo rings take between 3 and 5 business days to complete from the time the order is processed. That's actually pretty quick. How quick? Even though each camo ring at Titanium-Buzz is made to order, we still have some of the fastest lead times in the industry. However, depending on the material or style that you choose, production time for your ring can vary. Camo rings made from Damascus steel or that feature diamonds or other precious stones, for instance, can take up to 3 weeks in some cases. We strive to be upfront about this information so you can plan your order, and you can almost always find a production time estimate for a particular ring near the "Add to Cart" button on that item's page. To learn more about our ring lead times and production policies, please check out our shipping information page. It breaks down everything you need to know into easy-to-follow tidbits. We get it, sometimes a good thing can't wait. But since our items, particularly our camo rings, are so customized, our policy on rush orders is to take things on a case-by-case basis. Sometimes we don't even need to add a rush, sometimes there's nothing we can do, but regardless we are happy to help you out whenever we can. Keep in mind that we take great pride on getting folks their items in time for their big day or special event. 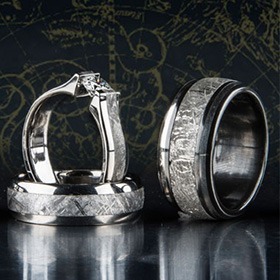 Also keep in mind that we offer overnight and second-day shipping options to get your order to you faster once your ring has been completed. You can select these shipping methods at checkout. 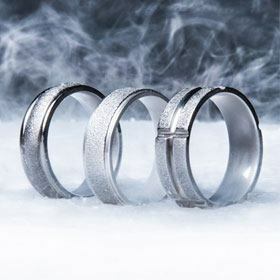 Please note: Due to the specialized materials and highly customized nature of these products, rush pricing and the completion timeframe will vary depending upon the type of ring you want and when you would like it to be completed. If you need to rush your order, please send us an email or call 1-866-215-1861 as soon as possible. You can also reach us via live chat support. The best. Always. We are proud to feature officially-licensed patterns direct from the masters at Realtree and Mossy Oak on all of our camo rings (except where noted). We also have a couple custom and digital camo patterns available on a few select items. The AP stands for "all-purpose," and this camouflage lives up to its name as one of the bestselling camo patterns in the world. It incorporates elements of common pines and hardwoods to match forests from almost all hunting regions. Popular with bow hunters and known for its neutral base and realistic contrasts, Realtree AP blends in beautifully at any distance. The Realtree MAX-4 pattern has come to dominate wetland and waterfowl camo. It features realistic, 3D presentations of oak and maple limbs alongside other floral life like sunflowers and millet. The special printing techniques and wide range of plant life showcased in this camo make it perfect for almost any open terrain. 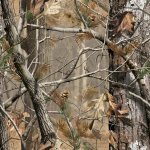 The style that inspired modern camouflage, the Mossy Oak Break-Up pattern is a multiple award-winning camo that's been a #1 bestselling favorite with outdoorsmen for nearly 20 years. 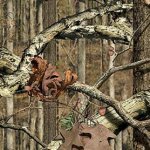 New innovations in texture, lighting effects, and shadows rank Mossy Oak Break-Up among the most realistic camo on the market. 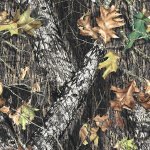 Over three years in the making, the Mossy Oak Break-Up Infinity pattern is the most advanced camouflage ever produced. Using layers of computer generated imagery, lighting effects, terrain mapping, and real world photography, Break-Up Infinity features an unmatched multi-dimensional depth of field that obliterates the human silhouette. It's so realistic it looks like you could reach into it, and now it's a Titanium-Buzz favorite. All of our products come with a limited lifetime warranty. You can also buy added coverage with our optional Protection Plan. Benefits of the Protection Plan include free engraving, a free size exchange, lifetime repairs, and more. The only cost you ever pay is shipping. If you have any questions or concerns about your ring, please call 1-866-215-1861 or send us an email. We hate to say it but no, it can't. The reason is the materials we use and the way our camo rings are made. The metals are so durable and the inlays are so precise that there's literally nothing we can do to change the size once they've been finalized. There is a remake fee for most size exchanges. Subscribers to our Protection Plan are covered by a free size exchange for one year. Coverage starts from the time you place your order. This means that if your ring doesn't fit the way it should during the first year, we'll replace it with one that does. For free. The only cost you'll have to pay for your replacement is shipping. Please note: There are some exclusions for a few specific ring styles. This is not a way for us to weasel out of our guarantee -- these instances are rare and we strive to be upfront about what you can expect with each purchase. If you are experiencing any sizing issues with your ring, please let us know as soon as possible. Send us an email or call us at 1-866-215-1861. To learn how you can ensure that your ring is a perfect fit, read the complete guide to ring sizing on our blog. Here's the deal: We don't mess around when it comes to our products. We spent a very, very long time designing the most durable and wear-resistant camo rings available anywhere. They're as tough as can be, but nothing is invincible. You will still need to follow some rules of basic care to ensure the continued quality of your ring. In fact, failure to follow these rules, which are listed below, may invalidate our Protection. DO NOT expose your ring to direct sunlight for prolonged periods of time. - No, you do not have to become a creature of the night. Just don't leave your ring sitting on the dashboard of your car all day in the middle of summer. It'll mess up the inlay. DO NOT wear your ring around strong chemicals or abrasive substances. - What you get up to in your laboratory is your business, just leave the ring out of it. Also, we hope you're wearing protective gloves around all those chemicals. DO NOT wear your camo ring when performing activities that could potentially damage it. - What does that mean? It means use a little judgment. If you're going to be working with heavy machinery or banging around inside an engine or something, you should take your ring off. Treat it with respect, you know? DO NOT clean your camo ring with an ultrasonic cleaner. - Not too many people have tried this one, but it can damage your inlay, so don't do it. DO clean your camo ring with warm water and pat it dry. - It'll keep it looking nice and shiny. DO show off your ring as much as possible. - You're the proud owner of one of the most badass rings ever made. Let 'em see it. Hell, yes. We can create many different custom styles to bring your vision of the ultimate camo ring to life. There are just a few limitations. We cannot, for example, combine one of our carved or etched designs (such as our animal track rings) with a camo inlay. That said, there's a lot we can do and we want to hear about what you have in mind. Nothing says "unique" like a ring you designed yourself, and if you think you're up for it, tell us about it. Send us an email or give us a call at 1-866-215-1861.